Workers in the US retire on average at the age of 61. At 67, it would seem that Janet Yellen is just getting started. The new head of the US Federal Reserve has been second in command to the current governor, Ben Bernanke, for the last three years. Now after a protracted appointment process, Ms Yellen is set to take on arguably the biggest job in the world economy. So what do we know about this woman, the first to take charge of the US central bank? Janet Yellen was born in 1946 in Brooklyn, New York. Her father was a family doctor and her mother taught at a local junior school. She was a star pupil at high school and won a place to study maths at Brown University, but quickly changed to economics, a subject she saw as more practically useful. While studying for a doctorate at Yale she was mentored by James Tobin, a Nobel prize winner famous for his ideas on taxation. Her first job was at Harvard in 1971 where she was an assistant professor, going on to teach Larry Summers. He was initially favoured by the White House to head the Federal Reserve, until opposition from liberal Democrats forced him to withdraw his name from consideration in September. Ms Yellen's first job at the Fed brought her not only experience of working at the world's most influential central bank, it also introduced her to her future husband, the economist George Akerlof, in 1977. The romance went into fast forward and within a year the couple were married, had both resigned from the Fed and had taken up teaching roles at the London School of Economics. Lord Desai, emeritus professor of economics at LSE, remembers the couple making quite an impact on both students and lecturers. "George Akerlof is a complete genius - an economist who is always thinking out of the box." "Janet was a very serious person and a very good economist. But I think at the time people underrated her as she was 'just' George Akerlof's wife." Work life and domestic life started to merge for the couple and they started to collaborate on academic research. "Not only did our personalities mesh perfectly, but we have also always been in all but perfect agreement about macroeconomics," Mr Akerlof wrote in a biographical note after winning the Nobel Prize in Economics in 2001. The couple returned to the US in the early 1980s, both taking academic jobs in San Francisco. Together they conducted research on subjects ranging from out-of-wedlock childbearing to the economic reunification of Germany. Ms Yellen's big break came in 1994 when she was appointed as a member of the board of governors of the Federal Reserve. She held the position until 1997 when she was appointed by President Bill Clinton to become chair of his Council of Economic Advisers. Ms Yellen took on the role as the Fed's eyes and ears on the west coast when she became head of the San Francisco branch of the central bank in 2004. Is Janet Yellen the 'fall gal'? The minutes from Federal Reserve meetings show that she did consider the possibility of a property market bubble as early as 2005, but along with the rest of the Fed committee failed to predict the scale of the financial crisis that started in 2007. "She was one of the people that did raise alarm bells, but I think like many others who saw the problems coming she did not anticipate the magnitude of the difficulties," according to Joseph Stiglitz, the economist who shared the 2001 Nobel Prize with Mr Akerlof, and who knows Ms Yellen well. "That was a very different attitude from many in the mainstream who saw absolutely no problem right up until the crisis," Mr Stiglitz told the BBC. Her position at the San Francisco Fed gave her greater exposure to the mechanics of decision making at the Federal Reserve and in 2009 she became a voting member of the interest rate setting committee, the Federal Open Markets Committee. By 2010 she had become a respected international emissary for the Fed, representing US economic policy at meetings across the world. Her hard work was rewarded when she was appointed vice-chair of the board of governors at the Fed replacing Donald Kohn, who went on to join the Bank of England. There is something, perhaps, to be made of her being the first woman to lead the Fed, arguably the second most important job in the US after the president. Prof Andrew Rose from the Haas School of Business taught with Ms Yellen at the University of California, Berkeley. He says he hopes the fact that she has broken a "glass ceiling" does not detract from her personal achievement in getting the president's nomination. "She is the most qualified person in the world for this job. The fact that she's a woman is an additional plus but it's her suitability as the next Fed chairman that I think people should concentrate on. "It could be that in a few years the two most important positions in the country are filled by women," says Mr Rose. So what's Janet Yellen like when she's not worrying about quantitative easing and unemployment statistics? "She's a shy person, but she can also be extremely funny. She likes a glass of wine and is an extremely good cook - her speciality is lamb chops," says Prof Rose. And for someone taking on such a huge role as Fed chairman, she has shown that she doesn't panic during a crisis situation. "We were in the same room during the huge 1989 earthquake which hit San Francisco," Prof Rose recalls. "We thought the building was going to collapse and I was convinced we were going to die. But Janet just stayed remarkably calm during the whole thing." 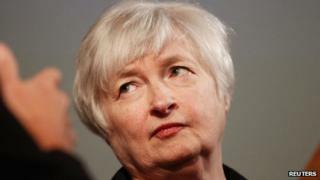 Is Janet Yellen the Federal Reserve's 'fall gal'? Video Who is favourite to be next Federal Reserve chairman?